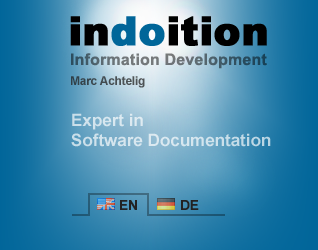 The services described in the “Services” section are provided by indoition Technical Communication Services Marc Achtelig. The products and books described in the “Products” section are marketed by indoition publishing e.K. Copyright 204 – 2019 by Marc Achtelig and licensors. All Rights Reserved. For details see Copyright. I estimate costs and plan deadlines realistically. I don't make promises that I can’t live up to. I aim to optimize your benefit, not my own profit. My goal is to exceed your expectations, not your budget.